Before looking at the characteristics of these rooms, you should first ask yourself what you hope to gain from your sunroom space. For example, if it is for a vacation home that is not used in the colder winter months, you will most likely be fine with a 3-season sunroom. However, if the sunroom is for your family's home and you intend on wanting to use the room as much as possible, it would be worth looking at the 4-season option. Both the three season, and four season sunrooms offer an affordable way to extend your outdoor living area. A place to relax and escape the problem of heat, bugs, or rain. These enclosures are great for entertaining or simply relaxing. Also, both structures may be used as an extension of your homes interior during the warmer months. The number one aspect to having a sunroom is the natural light, making the room warm and exciting! • Roof panel thickness of 3", 4 1/2", 6"
• Skylights of 18" x 34"
• Double pane glass - all sliding windows, doors and knee wall glass will be double pane, energy efficient glass. A heated 4-season room will stay warm throughout the colder New England months. • Vinyl components - all extruded aluminum frame parts will be wrapped in a vinyl sleeve, adding more protection and insulation against the elements. • Insulated floors - for year-round sunrooms installed on existing or newly built decks or porches, the floor system beneath will be well insulated. Is it possible to upgrade from a 3-season sunroom to a 4-season sunroom? As experienced sunroom contractors, we are sometimes asked if it is possible to upgrade a 3-season unit to a year-round style. Often times, homeowners who purchase a 3-season sunroom really love their space (no surprise there!) and so wish to get more use out of it throughout the year. While the exterior frame components cannot be easily upgraded to a vinyl room, it is possible to upgrade from single pane glass to double pane. The floor beneath can always be insulated at a later time as well. Learn more about the sunroom design process, all the options available, and get a free quote for the sunroom space you have always wanted by getting in touch with Betterliving Sunrooms of New Hampshire today. 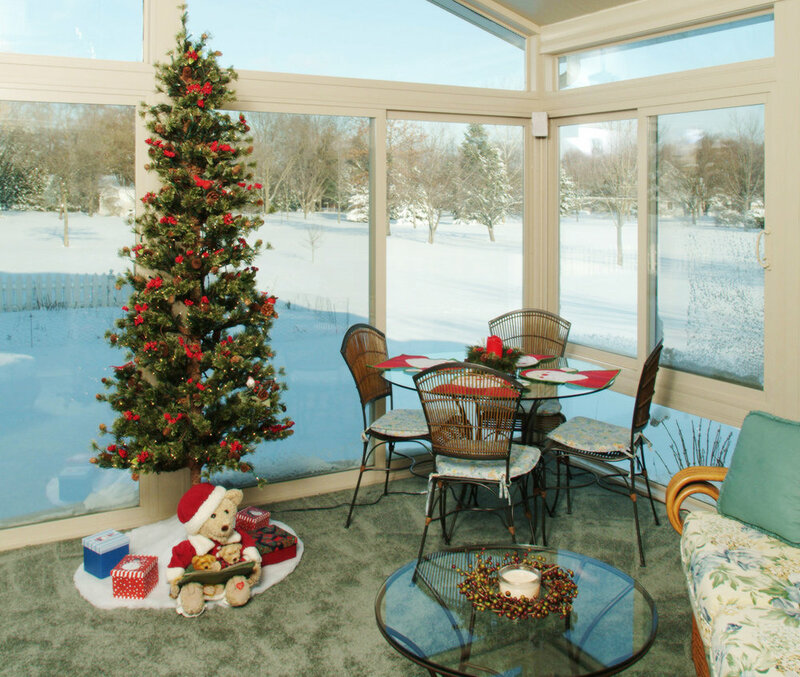 Whether you're looking for a 3-season sunroom or a year-round sunroom, we can help!